Original essays by leading scientists, historians, archaeologists, and anthropologists that address the related problems of unchecked population growth, scarcity of resources, climate change, and environmental pollution. Like many ecologically minded authors and thinkers before them, National Museum of Natural History curators Kress (The Weeping Goldsmith: Discoveries in the Secret Land of Myanmar, 2009, etc.) and Stine (America’s Forested Wetlands from Wasteland to Valued Resources, 2008, etc.) warn that these complex, still-to-be-resolved issues will endanger humanity’s future if they are not addressed immediately. As the title suggests, human activities have transformed terrestrial and maritime habitats, causing mass extinctions of other species at an unprecedented rate, comparable to a geologic turning point. “Our planet,” they write, “has been experiencing a multitude of dramatic and far-reaching changes.” The articles are grouped into five sections: “A Changing Planet,” “Drivers of Change,” “Responding to Change,” “Visual Culture,” and “The Way Forward.” Smithsonian Institute geologist Scott L. Wing sets the tone in the first section. “We are no longer a bit player in the story of this planet,” he writes, and “the influence of our actions now will change the global environment for at least hundreds of human generations to come.” In the second section the editors suggest that we must widen our notion of biosphere pollution to include “space junk” like “expended rockets…and dead satellites.” In “Black and Green,” Lonnie G. Bunch III, the founding director of the National Museum of African American History and Culture, points to the interconnections among environmental and racial issues created by the segregation in urban housing. 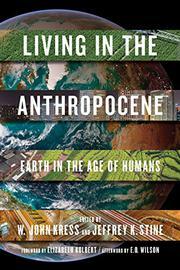 In an upbeat afterword, renowned biologist and naturalist professor Edward O. Wilson emphasizes that if humanity passes through the current “bottleneck of overpopulation and environmental destruction…human existence could be a paradise compared to today.” New Yorker writer Elizabeth Kolbert provides the foreword, and other contributors include Stephen J. Pyne, Wade Davis, and Kelly Chance. A valuable contribution to the ecological bookshelf.